Self-taught French engineer, inventor, and pioneer of flight before the Wright brothers using a steam-powered aircraft with bat-shaped wing in 1890. [With his] great man-carrying bird of Clément Ader [was] one of the most prominent and successful aviators of that active period. If the reports be true, Ader may justly claim to be the first person to navigate the air in a dynamic flying machine. However, it must be observed that his achievements did not at first arouse in France a great pitch of exultation and enthusiasm. There seemed at the time to be some skepticism as to the practicability of his device. But later cordial reparation was made by placing it on the Stand of Honor at the Aeronautical Salon, held in the Grand Palais, at Paris, in December, 1908. Clément Ader set out in life with the fixed determination to make a fortune, then to build a practical flying machine. Adopting the profession of electrical engineer, he quickly accumulated enough capital, as he thought, to realize his early ambition. He next visited Africa to study at close range the great soaring birds that Mouillard had described with so much admiration and vivacity. Going to Algeria he disguised himself as an Arab, and, with two Arab guides, journeyed to the interior where he watched the great soaring vultures, which he enticed with bits of meat to perform before him their marvelous maneuvers, wheeling in wide circles, and without wing beat, from earth to sky. After several years of study of the anatomy and flight of birds, Ader began, at the age of forty-two years, to construct an aeroplane. His first machine was a birdlike monoplane mounted on skids, or wheels, and driven by a 40-horse-power steam engine actuating a screw, placed forward. The total weight was 1,100 pounds, the spread 46 feet, the length 21 feet. The Eole, as he called it, received its first open-air test on the morning of October 9, 1890, in the grounds surrounding the Chateau d'Armainvilliers, near Gretz, a portion of the course being so prepared that the trace of the wheels would be visible. When everything was ready for the trial, Ader mounted the machine, in presence of a few friends, ran quickly over the ground, urged by the propeller thrust, then rose into the air and sailed 150 feet. Such is the report of the witnesses to what is claimed as the first flight of a human being in a power-driven flying machine. Subsequently this bold inventor built Eole No. 2, which, by special permission of the War Department, he tested on a prepared track, 2,400 feet long, on the Satory Camp. Over this course he ran his machine several times, and on one occasion flew 300 feet; but on alighting broke one of the wings. “Under these new conditions the workshop in the Rue Pajou was abandoned for larger premises in the Rue Jasmin, where the construction of the Avion was commenced in May, 1892, all persons engaged with the construction being under a military vow of secrecy. The motor was built first, and tested before a commission composed of army officers and some of the leading technicians of France. It was found to develop 30 horse power for a total weight of 32 kilogrammes; and even now, though seventeen years old, is regarded as a chef d'oeuvre. 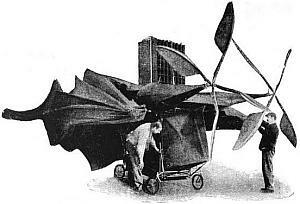 In the spring of 1897 the Avion was ready to make flights. Like its predecessors it was modeled on the form of a bat; but, although the wings could not be flapped, they could be folded, and could be advanced or retarded horizontally. “Everything appearing satisfactory, Ader informed the military commission that he was ready to undergo tests; the committee met at the workshops in the Rue Jasmin on August 18, 1897; were pleased with the machine, and ordered flights to be made immediately at Satory. It was not, however, until October 12th that a flight was attempted on the carefully guarded military ground, and in the presence of General Mesnier. The apparatus covered a distance of 1,600 yards, and although it did not fly, for this distance it is certain that on several occasions it completely left the ground. Ader declared that according to whether the wings were carried forward or to the rear, it was the front or the rear wheels only which left the ground. The pressure in the generator at this moment varied between 3 and 4 atmospheres. On increasing it to 6 or 7 atmospheres none of the wheels touched. “Satisfied with the results of the test, General Mesnier called the commission together for further trials on the following day, October 14, 1897. Unfortunately it was a rough, squally morning, that would have prevented many a modern aviator from bringing a machine into the open.. But as the officers had been brought together specially for this purpose, a flight was attempted. The last aeroplane, or Avion, weighed 1,100 pounds, spread 270 square feet, and was driven by a 40-horse-power steam engine actuating twin screws projecting before the bird-shaped flyer. The engine weighed but 7 pounds per horse power—quite a remarkable achievement for that day. 4 Feb - short biography, births, deaths and events on date of Ader's birth. Flight: 100 Years of Aviation, by R. G. Grant. - book suggestion. Clement Ader: His Flight-Claims and His Place in History, by Charles Harvard Gibbs-Smith. - book suggestion.